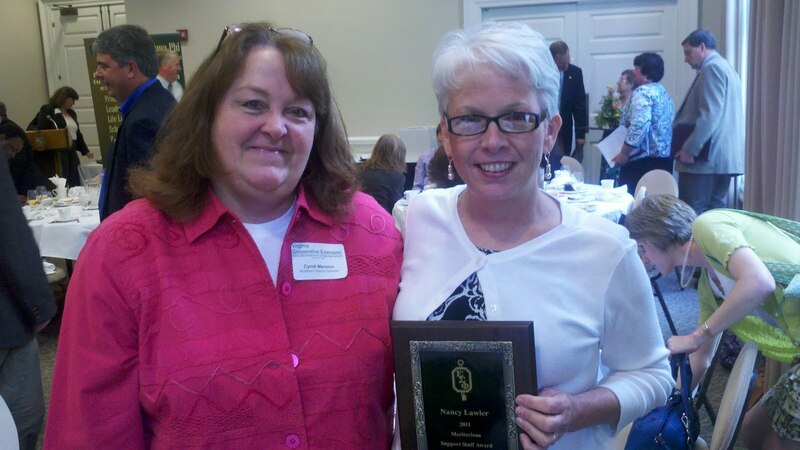 Congratulations to Nancy Lawler, Unit Administrative Assistant, who won the state Meritorious Support Award from Extension honor society Epsilon Sigma Phi. Nancy was recognized at the Virginia Extension Service Association meeting last week at Sweet Briar College with an engraved plaque and a beautiful flower arrangement. Nancy has worked for Extension for 34 years and most everyone who comes in contact with our office knows that she is the heart and soul of the office. From answering the phones to greeting visitors with a smile, Nancy will always go the extra mile to find information or publications, help a 4-H member complete an application, register clients for an event, or serve as a go-to person for information and answers. She puts in long hours, shows excellent attention to detail, and provides outstanding support and service to colleagues in the office. Please congratulate Nancy on her award the next time that you see her!